So for the last month or so I have been traveling around the UK, moving into a new house and taking on an already hectic workload from uni- seriously busy! Unfortunately my little blog has been neglected during this time :( but on the bright side I am settled and ready to blog frequently once more! The craziness of September is over, and as my favourite month begins there is a lot to look forward to...my 21st next weekend in Paris, friends' birthdays, autumn wardrobes and costume madness at Halloween. To sum up the end of summer I have posted an image of my summer project. 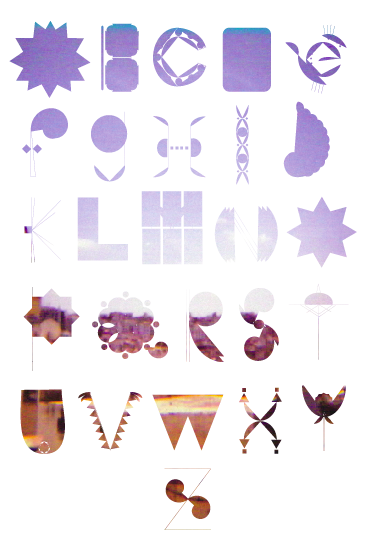 The brief was to create a concept using the alphabet to describe your summer experiences. My process was to take inspiration from Islamic design in architecture, i.e mosques, and create an alphabet inspired by this. I made an alphabet influenced by the traditional geometric shapes of islamic patterns. Once I had a foundation for this I then filled it in with a photograph I had taken of the city of Tangiers, Morocco. Finaaaalllly, I printed my design onto a dish dash (traditional muslim clothing) and presented it as a garment.